Welcome to Thompson Chiropractic & Rehab! You might wonder if we are truly able to achieve that goal. In some cases no, however the vast majority of our patients recover in a few short weeks and learn the means to prevent or greatly reduce recurrence. You might also wonder, How is this possible? There is a saying "If all you have is a hammer, everything looks like a nail." If all you do is adjust the spine or if you only work muscles or teach exercises, you tend to see subluxation or tight muscles or weak muscles as the sole cause of the problem. As powerful as the chiropractic adjustment, massage, ART® and rehab are alone, in combination they are much more so. Located in the heart of Auburn and serving King County and Pierce County, the leading health professionals at Thompson Chiropractic & Rehab are dedicated to treating our patients with compassion, respect, professionalism and understanding while providing the highest quality care possible. Dr. Phillip Thompson DC and his friendly, professional, highly trained and highly skilled staff are committed to providing each patient with personalized and highly effective healthcare. We offer gentle, safe care, centered on the special needs of each patient. One size does not fit all. We specialize in the treatment of auto accident or personal injury, work-related injuries, sports injuries, and repetitive stress injuries such as carpal tunnel syndrome and tennis elbow. 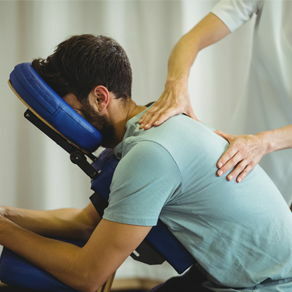 We effectively treat conditions such as low back pain, mid to upper back pain, neck pain, headaches including migraines, tendonitis, shoulder pain, sciatica and disc herniation. In addition, we regularly treat patients for mid to upper back pain which often extends to the chest, sometimes mimicking a heart attack. If you are having chest pain, call 911 and ensure that you're not having a heart attack. Having done so, seeing a chiropractor experienced in the treatment of ribs may be able to offer tremendous relief. We love treating people we are able to help, but if we can't help you, the last thing we want is to keep you coming. If we determine a patient is not a candidate for our services or that another type of provider may achieve better results, we offer referrals to the finest specialists in the region and are happy to send you to someone who can help you. For patients wishing to maintain a high level of pain free function following a course of treatment, we also provide wellness and performance care. How do we achieve excellence? · Extensive specialty training in Chiropractic Orthopedics, Sport Chiropractic, Active Release Techniques®, Graston Technique®, Rehab/Exercise Therapy, Kinesio Taping®, Nutritional and Lifestyle coaching and more gives us the tools to provide the customized care that you deserve. Why not receive the kind of care delivered to world class athletes. If you are new to our website, please feel free to discover and learn about chiropractic wellness. If you are interested in starting your journey towards wellness please subscribe to our award winning newsletter. If you are already a newsletter subscriber, please explore the member wellness section of our website for wellness articles, resources, and health facts---specifically targeted by Dr. Phillip Thompson DC to your wellness needs and interests. "Doesn't just mask the problems but finds ways to treat the problem. VERY clean facility, GREAT staff and an AWESOME Massage Therapist."